Four Seasons Sayan is a magical hotel with a beautiful backdrop of lush tropical valleys and the spectacular River Ayung. The 5-star facilities feature an outdoor pool, luxurious suites, villas, and a dining area offering popular delicacies. There are 18 suites and 42 private villas to choose from, each with sumptuous décor and distinctive Balinese details. The private terraces, meditation areas, and tropical gardens offer ample opportunities to relax and enjoy the scenic greenery of the surroundings. Guests wanting to explore the local area can enjoy hiking or cycling trips, with maps available from the expert staff at the hotel. Alternatively, immerse yourself in Indonesian culture as you indulge in the delicious cocktails, light meals, and western delicacies, which are served across the different cafés and restaurants at the hotel. A Kid’s Club and a library are also available for families. Hotel child prices apply to ages 0–17 years. This resort has 18 suites and 42 villas. Resting on the crest of a valley, this restaurant features Indonesian delicacies at its best. Munch on the Indonesian specialities as you enjoy the breath-taking views the river below has to offer. The adjacent wine cellar provides guests with a chance to choose from a wide variety of bottles. Meet friends, surf the internet, or indulge in house specialities over a delicious cocktail. Offering panoramic views of the sumptuous valley below, Jati Bar is the most informal spot in the resort. The shade of a palm or banyan tree is the best way to relax when devouring some typical French delicacies. Prepared with the herbs and ingredients grown in the hotel’s vegetable garden, guests can enjoy the freshest food possible. With the soothing symphony of Ayung River constantly ringing in the air, the two level swimming pool is a calm and tranquil oasis that follows the river’s natural curves. Surrounded by chaise lounges, a wooden deck and the Riverside Café, this is the perfect place to spend an evening or soak up the sun in the day. Children under 12 years must be supervised when using the swimming pool. 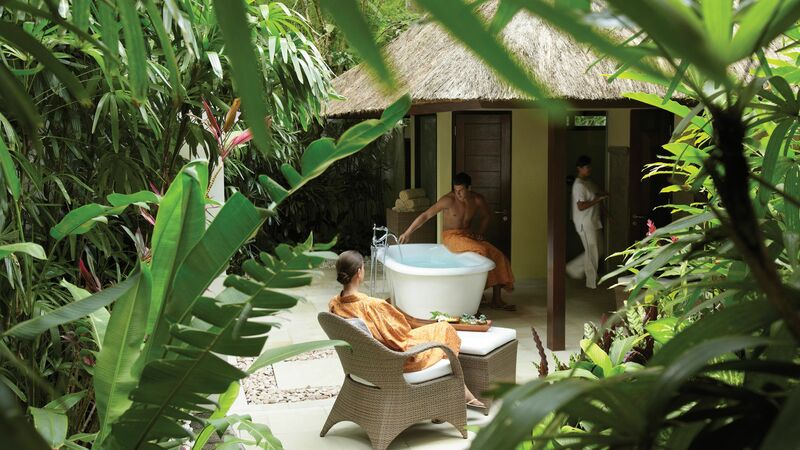 Embraced by the jungle greenery, the heavenly spa treatments offered by the Four Seasons Sayan bring out the water energy, and the ancient Balinese healing rituals and treatments help to rejuvenate your body. Surrounded by the vegetable and herb garden, the hotel’s open air cooking class offers visitors a chance to take a new expertise back home. Choose from the two different culinary themes – the Balinese class, or the plant-based class. The Balinese class includes typical Balinese dishes made during festivals and ceremonies while the plant-based class offers healthy and light cuisines. Home to cafés, restaurants, and street shops, Ubud is a cultural hub located in the centre of the island. Resting near Bali’s central upland, the town is brimming with ancient temples, royal palaces, green valleys, cultural landmarks, and rice terraces. At the town’s heart, you will find local museums and art galleries. Filled with diverse masterpieces crafted by the world’s notable artisans, these galleries hold a wealth of sights. As you travel further into the countryside, choose from activities including the Bali Safari and Marine Park, and the Ubud Art Market. Thrill-seekers will find plenty of trips where you can immerse yourself in nature as you try adrenaline fuelled activities. Choose from Quad Bike adventure tours, white water rafting and lots more. Four Seasons Sayan is a 75 minute drive from the Ngurah Rai International Airport. One Bedroom Villas measure 234m² and enjoy exotic surroundings, with ample amounts of living space. Villas feature all the generic amenities as seen above, but enjoy spectacular views of the rice terraces, resort and tropical forests, private lily pond and meditation area, outdoor living area with dining table, lounge chairs and plunge pool, spacious bedroom with king bed or two queen beds, walk-in closet, lavish bathroom with outdoor shower. The hotel is incredible and has delicious food and extremely nice attention from all the staff from the arrival to the departure. We had so many tours that we didn?? ?t enjoy the hotel as we would wish to. As a recommendation have a free day at least to enjoy the full experience of the hotel. This was our first time staying at a Four Seasons resort, but once we saw that Travel + Leisure rated this the best hotel in the world we couldn't resist. It was a splurge for us but one that was worth every penny. If you're worried about the price, or that the price will make you want to stay in your room all day - do yourself a favor and book the room. Your private accommodations will be exceptional, the experience will be truly personal, and the day trips you plan through the resort will be reasonably priced and far above the quality you could get elsewhere. It's an incredible place that will take your vacation to the next level. 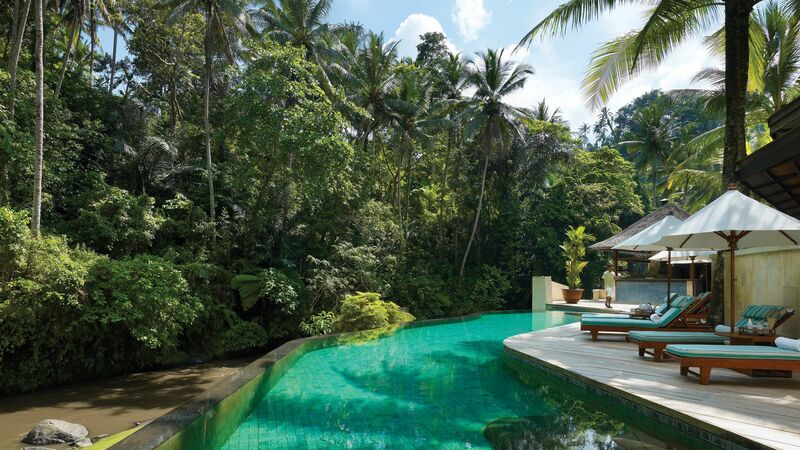 The Four Seasons Sayan is an essential place to stay if you are visiting Bali. My wife and I split our time between the two Four Seasons on Bali, and they are very complementary and equally excellent. If you only read one sentence of this review, know that this resort has been recognized as the best in the world for a reason, its amazing people, who are as warm as the sun on a bright Balinese afternoon - Remarkable! Ever wondered what it would be like to feel like a celebrity? Look no further. Having visited luxurious properties all over the world, this one is set apart in every way. From the moment you arrive to the lush oasis that is Sayan, gracefully greeted either at the airport or at the resort with a flower ceremony, crossing the bridge to the main lobby is a transformation of the body and soul into paradise. The rooms are wonderfully appointed, and the grounds meticulously kept, as they are part of the jungle landscape with the sounds of the flowing Ayung River omnipresent. After experiencing the magic of Bali and the Four Seasons 5 years ago on our honeymoon, we returned with our (4 year old) daughter. It was like no time had passed at all, rather a brief separation from this place that feels like home. Kerti, Dewa, and the entire team at the front desk were excited to see us, and to meet our little one, who they made feel like a princess for our entire stay. Everyone working at the resort knows every guest by name, and takes care to know what makes every guest happy, taking extraordinary measures to make you feel like you're the only guest there, regardless of how many others may be staying there. We were told there were a lot of people experiencing the resort when we were there, but it never felt busy or crowded. We started every day with a couple hours at the Ayung Terrace for breakfast. They remembered my tropical fruit preferences from 5 years ago, and brought it to the table unprompted on our first day (and each day thereafter). 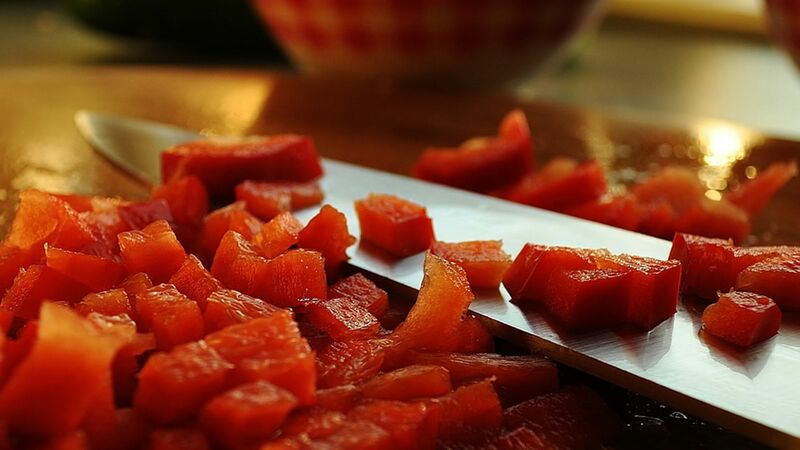 When my wife asked for something they didn't have, Jeni asked her food buyers to look for it at the market the following day (they source many of their fruits locally to ensure incredible freshness), and "voila," it appeared on our table the next day, along with many other wonderful delicacies. Can't decide what you like on the breakfast menu? They'll bring you everything if you like (no joke), and everything is prepared beautifully, and to order...the ultimate "a la carte" buffet, served by the friendliest people in the world. Our daughter loved the "Pici Pici" kids club, and spent time with April & Rainey making arts and crafts, learning new yoga poses, and making milkshakes! Perfect for when mommy & daddy wanted to grab a relaxing massage, knowing that there's a place for the kids to have an amazing time. Next time she'll try making the watermelon pizza! The relationships made here will last a lifetime, and be close to our hearts until we visit again. If you have any questions about this amazing place, please feel free to reach out to me directly, as I'd be delighted to talk about it anytime. Thank you Four Seasons Sayan. We love you. This review is a little behind time but I guess better late than never. In August 2018 my wife and I celebrated our wedding anniversary at this uniquely special establishment. Having already held our wedding ceremony and reception there 3 years earlier, we already knew of the impeccably high standards of service and minute attention to detail that the resort is known for. I can honestly say that from the moment we arrived our preconceived expectations were exceeded. Almost all staff we came into contact with knew our names and that we had returned to celebrate our anniversary. The crowning jewel was the romantic anniversary dinner organised for us at the Riverside Terrace. The staff endeavoured to ensure everything was perfect from an exclusive table setup to the mouth-watering menu that we indulged in. A big thank you to Ketut Sena and all the staff at the Riverside Terrace for making this an unforgettable evening. We definitely look forward to returning in our anniversaries to come and building upon these unforgettable memories.